A digital audio workstation (D.A.W.) is an electronic device or computer software application for recording, editing and producing audio files such as songs, musical pieces, human speech or sound effects. DAWs come in a wide variety of configurations from a single software program on a laptop, to an integrated stand-alone unit, all the way to a highly complex configuration of numerous components controlled by a central computer. Regardless of configuration, modern DAWs have a central interface that allows the user to alter and mix multiple recordings and tracks into a final produced piece. 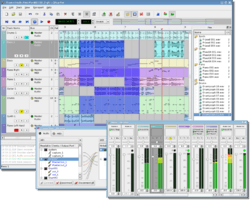 DAWs are used for the production and recording of music, radio, television, podcasts, multimedia and nearly any other situation where complex recorded audio is needed. By the late 1980s, a number of consumer level computers such as the Apple Macintosh, Atari ST and Commodore Amiga began to have enough power to handle digital audio editing. 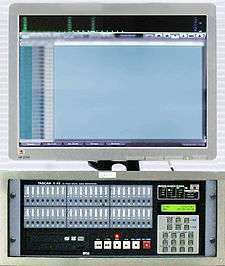 Engineers used Macromedia's Soundedit, with Microdeal's Replay Professional and Digidesign's "Sound Tools" and "Sound Designer" to edit audio samples for sampling keyboards like the E-mu Emulator II and the Akai S900. Soon, people began to use them for simple two-track audio editing and CD mastering. In 1994, a company in California named OSC produced a 4-track editing-recorder application called DECK that ran on Digidesign's hardware system, which was used in the production of The Residents' "Freakshow" [LP]. This combination of audio software and hardware was one of the earliest examples of a DAW. In 1993, German company Steinberg released Cubase Audio on Atari Falcon 030. This version brought DSP built-in effects with 8-tracks audio recording & playback using only native hardware. The first Windows based software-only product, introduced in 1993, was Samplitude Studio (which already existed in 1992 as an audio editor for the Commodore Amiga). "DAW" can simply refer to the software itself, but traditionally, a computer-based DAW has four basic components: a computer, either a sound card or audio interface, digital audio editor software, and at least one input device for adding or modifying data. This could be as simple as a mouse (if no external instruments are used) or as sophisticated as a piano-style MIDI controller keyboard or automated fader board for mixing track volumes. 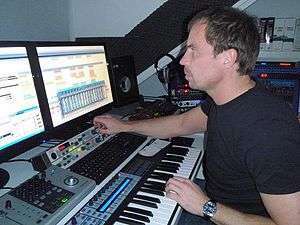 Computer-based DAWs have extensive recording, editing, and playback capabilities (some even have video-related features). For example, musically, they can provide a near-infinite increase in additional tracks to record on, polyphony, and virtual synthesizer or sample-based instruments to use for recording music. A DAW with a sampled string section emulator can be used to add string accompaniment "pads" to a pop song. DAWs can also provide a wide variety of effects, such as reverb, to enhance or change the sounds themselves. Multitrack DAWs support operations on multiple tracks at once. Like a mixing console, each track typically has controls that allow the user to adjust the overall volume, equalization and stereo balance (pan) of the sound on each track. In a traditional recording studio additional rackmount processing gear is physically plugged into the audio signal path to add reverb, compression, etc. However, a DAW can also route in software or use software plugins (or VSTs) to process the sound on a track. Rosegarden is a multi-featured audio application that includes audio mixing plugins, a notation editor, and MIDI. The MusE Sequencer is a similarly featured audio application that includes an audio mixer and a MIDI sequencer. 1 2 Kefauver, Alan P.; Patschke, David (2007-01-01). Fundamentals of Digital Audio, New Edition. A-R Editions, Inc. p. 133. ISBN 9780895796110.